Multi-scale associations between vegetation cover and woodland bird communities across a large agricultural region. Improving biodiversity conservation in fragmented agricultural landscapes has become an important global issue. Vegetation at the patch and landscape-scale is important for species occupancy and diversity, yet few previous studies have explored multi-scale associations between vegetation and community assemblages. Here, we investigated how patch and landscape-scale vegetation cover structure woodland bird communities. We asked: (1) How is the bird community associated with the vegetation structure of woodland patches and the amount of vegetation cover in the surrounding landscape? (2) Do species of conservation concern respond to woodland vegetation structure and surrounding vegetation cover differently to other species in the community? And (3) Can the relationships between the bird community and the woodland vegetation structure and surrounding vegetation cover be explained by the ecological traits of the species comprising the bird community? We studied 103 woodland patches (0.5 - 53.8 ha) over two time periods across a large (6,800 km(2)) agricultural region in southeastern Australia. We found that both patch vegetation and surrounding woody vegetation cover were important for structuring the bird community, and that these relationships were consistent over time. In particular, the occurrence of mistletoe within the patches and high values of woody vegetation cover within 1,000 ha and 10,000 ha were important, especially for bird species of conservation concern. We found that the majority of these species displayed similar, positive responses to patch and landscape vegetation attributes. We also found that these relationships were related to the foraging and nesting traits of the bird community. Our findings suggest that management strategies to increase both remnant vegetation quality and the cover of surrounding woody vegetation in fragmented agricultural landscapes may lead to improved conservation of bird communities. We conducted our study in the South-West Slopes bioregion of New South Wales, in southeastern Australia. Native vegetation within the region is predominantly temperate eucalypt woodland, with approximately 15% of original vegetation cover remaining. For this study, we focused on 103 woodland patches located on 35 farms within the region (Fig. 1). The patches included old growth (n = 59) and regrowth (n = 44) woodland, and ranged in area from 0.5 ha to 53.8 ha (mean 9.3 ha). All were located in mixed cropping/grazing landscapes. We established a permanent field site in the centre of each patch in 2002; these were separated by a minimum distance of 120 m (average 800 m). A site consisted of a 200 m transect with three survey points, located at the 0 m, 100 m and 200 m distances. We surveyed the birds and vegetation at each site in 2002 and 2008 (see below). During this time, southeastern Australia experienced the most severe drought recorded since 1900. The “Millennium Drought” spanned the period 2001–2009, representing an unprecedented number of sequential years with below-median rainfall. The effects of this drought included a 45% reduction in stream flow and increased tree mortality in dryland ecosystems. 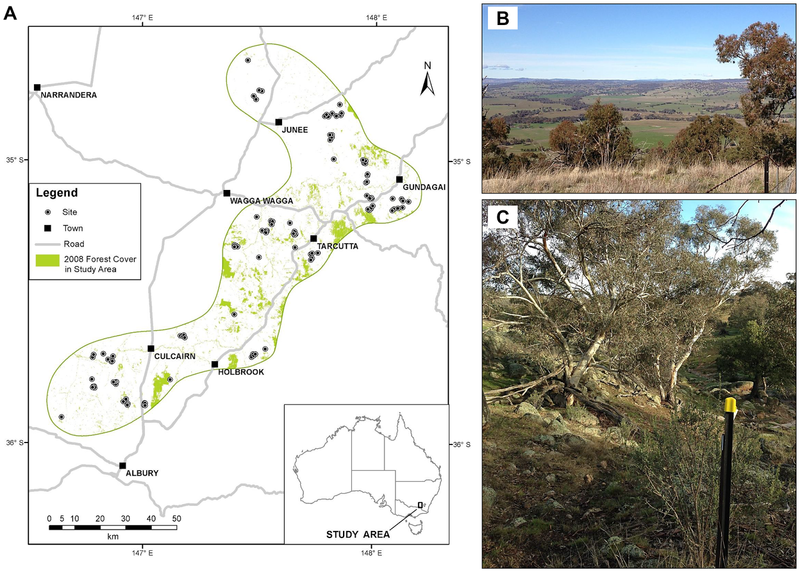 The South-West Slopes Restoration Study, New South Wales, Australia: (A) location of woodland sites across the region [note that site points are not drawn to scale], (B) native vegetation cover in the surrounding landscape, and (C) a survey site in a woodland patch. We found that several of the vegetation variables differed significantly between 2002 and 2008. The amount of tree dieback in the woodland patches increased significantly between these two periods, as did the canopy depth. The number of strata and the midstorey cover occurrence decreased significantly. The other woodland vegetation attributes did not significantly differ between the two years. In the surrounding landscape, percent woody vegetation cover increased significantly at all three scales of measurement. This increase primarily reflects growth of vegetation within existing revegetation plantings and woodland patches to the 20% minimum canopy cover, 0.2 ha area and 2 m height thresholds to be classified as vegetation cover in 2008 compared with 2002. We recorded 92 species of birds in 2002 and 2008, excluding waterbirds. Our surveys showed a very high level of thoroughness, with the number of species observed ranging between 90.12% and 99.91% of estimated richness. We recorded 87 species at ≥2 sites in 2002 and 2008 combined, 70 species at ≥2 sites in 2002, and 80 species at ≥2 sites in 2008. Of the 17 species of conservation concern observed during the study period, 16 were recorded at ≥2 sites in one or both years. The Speckled Warbler (Chthonicola sagittata) was recorded at only one site in 2002 and 2008 and was excluded from analysis. Similarities among bird species of conservation concern in their relationships to patch and landscape-scale vegetation cover suggest that management strategies aimed at individual species are likely to have wider benefits for other species. In the remainder of this paper, we discuss management strategies to increase woodland patch vegetation quality and the cover of surrounding woody vegetation in fragmented agricultural landscapes to achieve the improved conservation of woodland bird communities. We advise that these management strategies be implemented under an adaptive monitoring framework to assess their outcomes. The presence of mistletoe in the woodland patches (irrespective of its abundance) was important for structuring the bird community, and associated with species of conservation concern. As such, we recommend that greater consideration be given to the maintenance and perpetuation of mistletoe in agricultural landscapes. Management may have to be undertaken indirectly, however, because mistletoe cannot be transplanted and inoculation is difficult to achieve. Instead, management approaches aimed at increasing woodland condition may be more effective: higher quality remnants may attract the bird species capable of dispersing mistletoe seeds and improved tree health will enable the deposited seeds to grow and mature. In contrast to other species of conservation concern, the Superb Parrot was associated with sites with large canopies and hollow-bearing trees, reflecting its distinct habitat preferences. Large, old living and dead trees provide hollows crucial for the Superb Parrot and other hollow-nesting species, and woodland patches with dense stands of smaller or younger trees do not provide equivalent resources. The Superb Parrot thus serves as a reminder that it is important to have structural diversity across woodland patches, i.e. “don’t have the same thing everywhere”. We found that the cover of woody vegetation in the surrounding landscape was associated with bird community composition. Woodland patches supported more species of conservation concern when in landscapes with high woody vegetation cover at the 1,000 ha and 10,000 ha scales. Landscape-scale vegetation cover may buffer changes in patch-scale vegetation cover, and measures to increase native vegetation cover in agricultural landscapes are vital to improved conservation outcomes. A potential focus for management interventions includes increasing/preserving stands of native regrowth, which provides habitat for a range of species, including many woodland birds. It is therefore important that regrowth receives sufficient formal protection. For example, in our study region, native vegetation that has regenerated since 1990 is classified as regrowth and is regulated by government legislation on tree clearing (Native Vegetation Act 2003). Proposed changes to this legislation, however, will allow ‘thinning’ of dense vegetation such as regrowth. This raises concerns for the structural integrity of regrowth and its associated benefits for woodland birds. Another widely applied management intervention to increase landscape vegetation cover in agricultural landscapes worldwide, and in southeastern Australia in particular, is to actively revegetate areas. This approach provides important habitat for woodland birds, including many of conservation concern, and may be an important adaptation to climate change. However, extreme climatic events, such as drought, can be detrimental to the success of restoration efforts, and it is critical that revegetation programs consider these potential impacts. One measure to improve the success of revegetation plantings is to choose plant species capable of establishing and surviving drought. Improving biodiversity conservation in fragmented agricultural landscapes has become an important global issue. This is evident through the large investments in farmland biodiversity that are becoming increasingly common (e.g. agri-environmental schemes). Missing from much of the ecological research underpinning these schemes, however, are investigations at the level of the community assemblage. Addressing this knowledge gap improves our ability to generalise across agricultural landscapes, and leads to integrated multi-species conservation policies and management. Our investigation of multi-scale associations between vegetation cover and woodland bird communities shows that both patch-scale vegetation structure and landscape-scale vegetation cover are important determinants of community composition. This finding supports those from previous species-specific and species diversity research, and from different regions worldwide. Further, species of conservation concern showed similar responses. This suggests that the species under most threat in agricultural landscapes will be positively affected by undertaking management actions to improve woodland condition and landscape vegetation cover.